Janice P. — Ascend P.T. 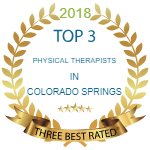 I highly recommend Ascend Physical Therapy. I worked with Heather and she patiently listened to all of my concerns. I was impressed with her in-depth knowledge, her verbal explanations, and her gentle therapeutic touch. With her physical therapy and easy to understand home exercises, I immediately started feeling better. She took care of everything, including: working with the insurance company, prompt return of phone calls and flexible scheduling. I felt very comfortable trusting her with my care and attribute my full recovery to her. I have no doubt that anyone I refer to her will have a similar experience.